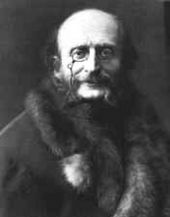 Jacques Offenbach (June 20, 1819 – October 5, 1880), composer and cellist of the Romantic era, was one of the originators of the operetta form. His light comical compositions reflected the ease and frivolity of life in France during the late nineteenth century. Offenbach sought to explore a universe of flamboyant French feeling by composing music that is characterized by gaiety and cheerfulness. Often writing it a satirical style and dealing with mythological subjects, Offenbach's opera "Orpheus in the Underworld," caused great controversy in the French musical community. Near the end of his life, he wrote one serious opera, The Tales of Hoffmann, which became his more famous work. He was a highly prolific composer with over 100 stage works to his credit. 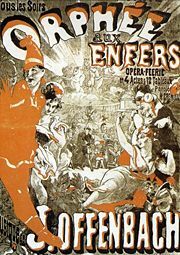 The galop from Offenbach's Orpheus in the Underworld is the tune most associated with the can-can, a physically demanding music hall dance, performed by a chorus line of female dancers. Offenbach was born in Cologne, Germany and was the son of Isaac Juda Eberst a cantor, bookbinder, music teacher and composer. His father was living at a time when a Napoleonic edict required that Jews had to take inheritable family names. A part-time itinerant violinist, he adopted the name Offenbach since he was already known to his audiences as a native of Offenbach am Main called "der Offenbacher." His son, Jacques, received the name "Jakob Offenbach" at birth, but he changed it to Jacques when he settled in France. Jacques Offenbach moved to Paris in 1833 to study the cello. He found employment playing this instrument in the orchestra of the Opéra Comique and wrote many pieces for the instrument. In 1844, he converted to Catholicism and married Herminie de Alcain. He returned to Germany with his wife and daughter in 1848 to avoid revolutionary violence in France, but returned a year later to become the musician most closely associated with the reign of Louis Napoleon (III). In 1850, he became conductor of the Théâtre Français, but in 1855, rented his own theater, the Bouffes Parisiens on the Rue de Monsigny and began a successful career devoted largely to operetta and opéras comiques until his death. Offenbach's music is often associated with the dance known as the "can-can." In his many popular operettas, he created beautiful flowing melodies that delighted the Parisian. Rossini dubbed him the “little Mozart of the Champs-Elysées.” His most popular works are still performed regularly today. His best-known operettas in the English-speaking world are Orpheus in the Underworld, La vie parisienne, La belle Hélène, La Périchole, and The Grand Duchess of Gerolstein. By the 1870s, Offenbach's popularity in Europe had been steadily declining, and in an attempt to increase his stature and pay mounting debts, he undertook an American tour conducting concerts in New York and Philadelphia. His American tour resulted in a book that documented his experiences entitled, Offenbach in America (1877). After returning to Paris he composed ten more operettas, but none of them achieved the level of success that his early works had attained. As a result of these disappointments he became somewhat of a recluse. In an attempt to attain one last bit of success, he undertook composing working on what would become his most famous work, The Tales of Hoffman, which would become his most famous opera. The Tales of Hoffmann, was more serious than his other works, perhaps reflecting the eternal wish of the clown to be taken seriously. It was still unfinished at his death in 1880, but was completed by his friend Ernest Guiraud and premiered in 1881. 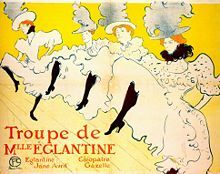 Gaîté Parisienne is an often-heard ballet score which is a pastiche of Offenbach melodies arranged and orchestrated by Manuel Rosenthal in 1938. Another posthumous work, Myriame et Daphné, with a libretto by Philippe Gille, debuted in 1907. Offenbach is buried in the Cimetière de Montmartre, Paris, France. Offenbach's music achieved a fair degree of popularity in the United States, however certain guardians of of "high culture" worried about the the frivolous nature of his music. America in the early twentieth century was experiencing a debate over the importance of art and music in developing a moral society, and Offenbach's music was often cited as contributing to the dissolution of good taste and sobriety. Writing in Cosmopolitan Magazine in 1900, Harry Thruston Peck asserted that Offenbach's music contributed to social decadence in France and would do the same in America. There was a pervasive thought in cultural circles that any art form that was overtly popular was "false culture" and was not worthy of the same high esteem accorded to the work of a Beethoven or Shakespeare. Offenbach was somewhat of an innocent bystander in this debate as he was not a staunch ideologue in terms of artistic moralizing, but rather saw himself as a professional composer practicing his craft. Offenbach wrote in a fluent, elegant style often dealing with mythological subjects in a satirical tone. His recognition was in his "can-can" music as well as his operettas or light operas with a dialogue. He had the unique ability in creating beautifully flowing melodies which was what audiences wanted to hear and the Parisian population in the mid to late nineteenth century especially enjoyed music and drama of a simple and frivolous nature. Offenbach appreciated his notoriety as a popular composer. 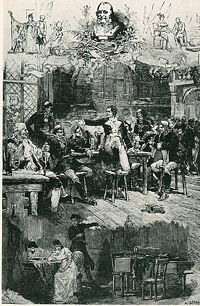 However, he was also concerned about his musical legacy; thus, he wrote the satiric opera, Orpheus in the Underworld, which caused an upheaval in the French musical community. He also wrote one fully operatic masterpiece, Les contes d'Hoffmann (The Tales of Hoffmann), which would ultimately become his most famous work. He wrote over 100 musical works for the stage works, many of which are still performed. Faris, Alexander. Jacques Offenbach. New York: Scribner, 1981. ISBN 0-684-16797-2. Harding, James. Jacques Offenbach: A Biography. London: J. Calder, 1980. ISBN 0-714-53835-3. Levine, Lawrence W. Highbrow/Lowbrow: The Emergence of Cultural Hierarchy in America. London: Harvard University Press, 1988. ISBN 0-674-39076-8. Moss, Arthur, and Evalyn Marvel. Cancan and Barcarolle: The Life and Times of Jacques Offenbach. Westport, CT: Greenwood Press, 1975. ISBN 0-837-18045-7. This page was last modified on 14 March 2018, at 20:27.